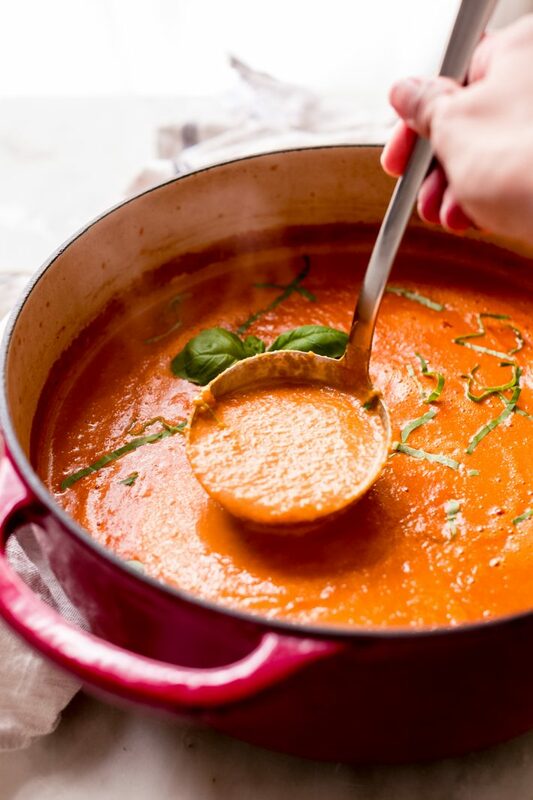 Enjoy a creamy, luxurious tomato basil soup without the guilt! There is no cream, sugar, or any unnecessary additives in my Tomato Basil Soup! Plus, the secret ingredient makes this soup so so good! 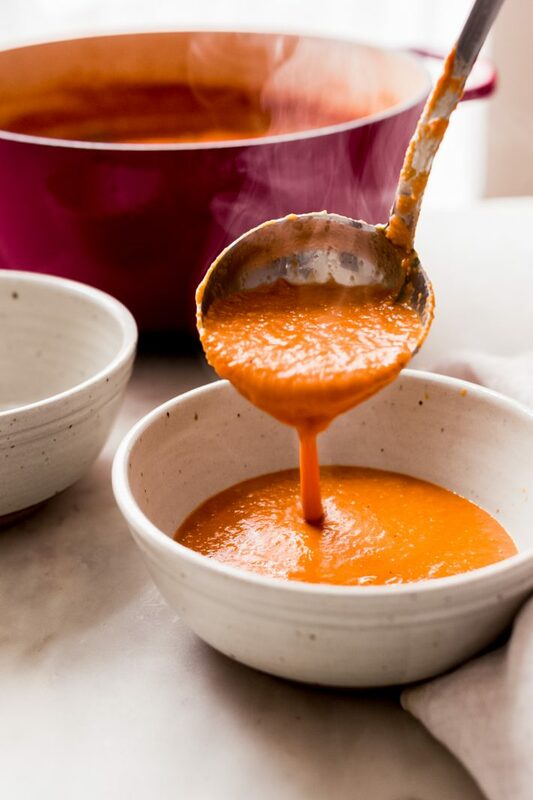 What you WON’T find in this homemade tomato soup is a bunch of cream or sugar. I haven’t been able to get this creamy, luxurious, sweet, and comforting soup out of my mind for weeks. Tomatoes are still hanging around my farmers market, and I’m taking advantage! I can’t wait to make tons of salads , soups , and other goodies with them before we go into the deep freeze of winter. If you’ve been following LSJ since the beginning, you know I’ve done a tomato basil bisque in the past. My ashamed self is admitting to you that I had to put cream in it to make it taste as good as it did last time. In my defense, I did make that soup when the tomatoes weren’t quite at their best. Which meant less natural flavor and that means I needed extra herbs to help make the tomato flavor a little noticeable. But never, ever, ever again. I can’t wait to make a big batch of this every week to have on hand for lunches and midday snacks. 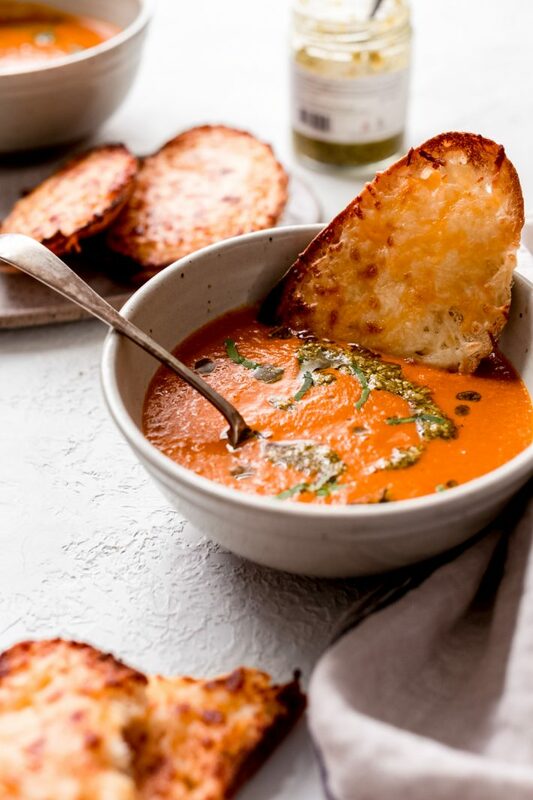 Yes, tomato soup is perfect with a little bit of grilled cheese when you need a little something to nibble on. Not to mention that it’s exactly what you need if you’ve caught the early fall sniffles. You will undoubtedly sleep like a 5-month-old baby if you’ve got a belly full of this soup in you. 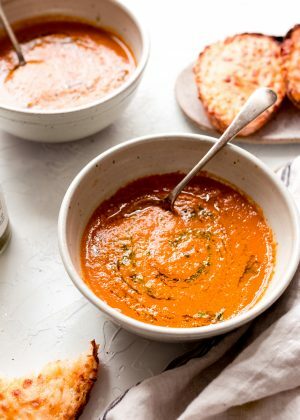 What makes my secret ingredient tomato basil soup so unique? One thing that I forgot to mention is that not only is there a secret ingredient in my tomato basil soup, there is also a secret method. 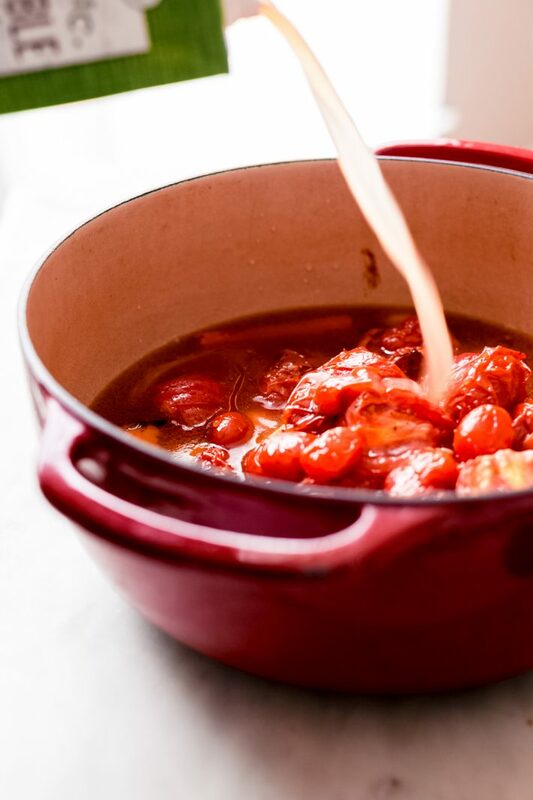 The thing about this soup is that the longer you roast the tomatoes, the more sinfully delicious the pot of soup will be. Take your time, enjoy the process. Massage those tomatoes, carrots, onions, and garlic with some olive oil and a generous sprinkle of salt and pepper and pop them in the oven on a low heat setting for one hour. The slow baking process helps to caramelize the veggies a bit on the outside and develops more flavor in the tomatoes and brings out its natural sweetness. They’re wrinkle and cute and loaded with so much flavor when you pull that tray out of the oven. Bonus: your house is gonna smell like a Tuscan tomato field! 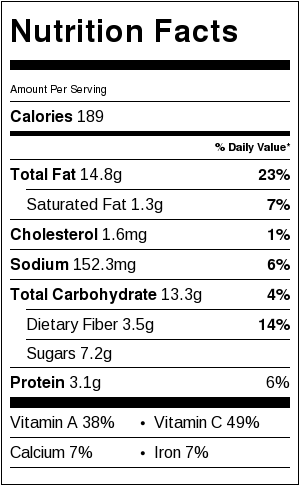 There’s also zero sugar in my tomato basil soup. Only the natural sweetness from the slow roasting process and the carrots that are going into this soup. Now, go. Use that hour to its full advantage. Me? –>I popped in a quick Gillian Michaels workout DVD that I hadn’t done in ages and within 10 minutes I was screaming bloody murder because I couldn’t feel any of my limbs. I spent the following 50 minutes cursing Gillian under my breath and vowing to use this DVD sparingly. Homegirl. I’m sure you’ve helped a lot of people, but your beginners level DVD is not for BEGINNERS. So what’s so secret about secret ingredient tomato basil soup? That super concentrated flavor of basil pesto makes this tomato basil soup NEXT LEVEL STUFF. The pine nuts from the pesto add such nice depth and creaminess that you’ll forget about adding that heavy cream or half and half in and opt for this more flavorful/ healthier option instead. 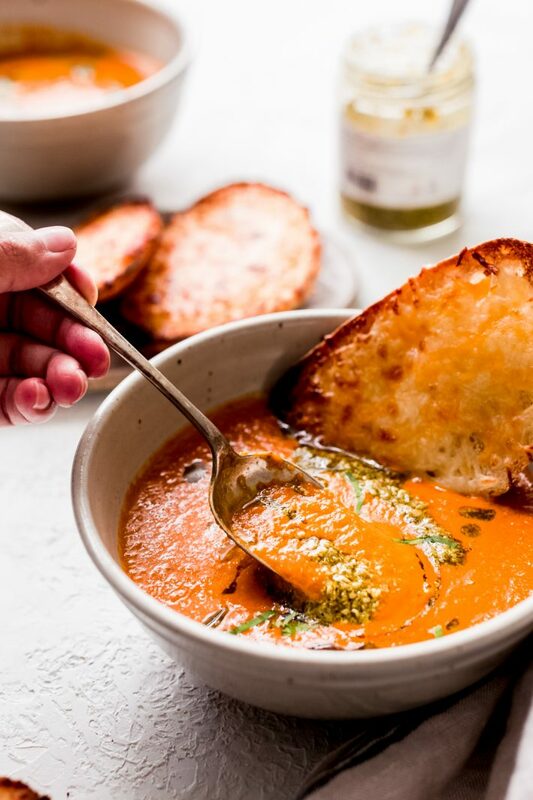 The parmesan in the pesto also adds just the right amount of cheesiness to the soup without overpowering it. 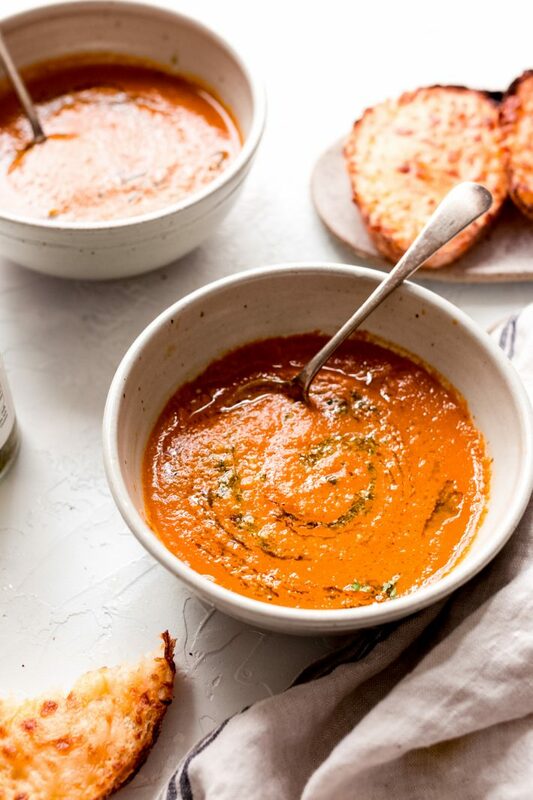 This tomato basil soup is exactly what you need to cure that cold that’s starting to come on from the weather changing so rapidly. And it’s perfect for the fall! 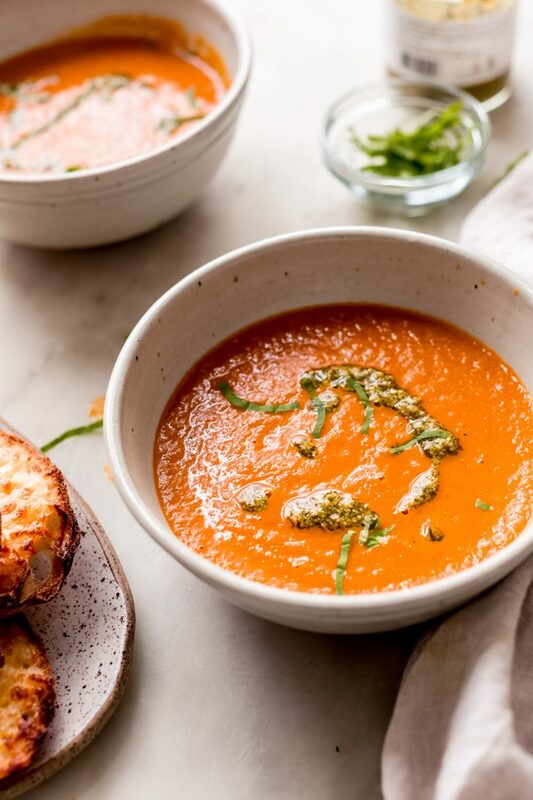 Imagine a chilly evening complete with a warm blankie, comforting tomato basil soup, and a grilled cheese sandwich to dip, dunk and munch on. For the colder months, the grilled cheese is a MUST. For summer, I served this soup with cheesy toasts. It’s just a bit of provolone on a slice of baguette with a pinch of salt, garlic powder, and a bit of Italian seasoning. What else do you need to make secret ingredient tomato basil soup? The ingredient list is short, but the flavors are huge! How to make secret ingredient tomato basil soup? The first step in making the best tomato basil soup recipe is roasting the tomatoes, onions, carrots, and garlic. Once you’ve done that, it’s as simple as adding the ingredients to a blender and blending them with some of your stock until it’s smooth. Keep in mind that if you’ve got a powerful blender like a Vitamix  (affiliate link) or a Blendtec  (affiliate link), it’ll blend your soup up nicely! If you have a traditional blender, it may take a little longer so you may want to do it in several batches. Once blended, you’ll add all the remaining ingredients to the soup pot and then bring it to a full simmer before serving. This process can be even simpler if you’ve got an immersion stick blender  (affiliate link.) I made this purchase a few years ago, and it has made life so much simpler. If you’ve got one too, you can add the roasted veggies right into the stock pot along with all the remaining ingredients and blend until smooth. Then let it heat all the way through, and you’re ready to serve. What if I follow a vegan diet, can I still make this tomato basil soup? If you’re living a dairy-free or vegan lifestyle, you can still make this soup! 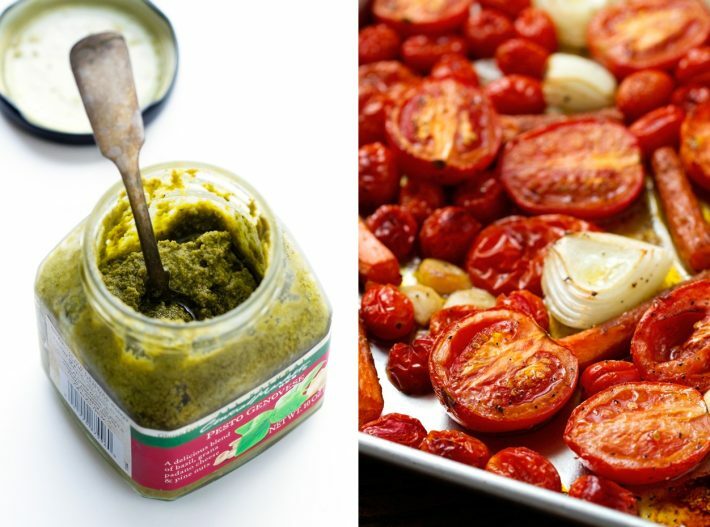 There are tons of recipes on the internet for vegan pesto (where the parmesan is replaced with a hint of nutritional yeast), and most health food stores even sell vegan pesto! Just make that simple swap, and you’re good to go. ORIGINAL RECIPE POSTED Aug. 10, 2015. UPDATED ON Oct. 28, 2018, WITH NEW PICTURES AND EASIER DIRECTIONS. ROAST: Position a rack in the center of the oven and preheat the oven to 375ºF. Place the tomatoes, onions, garlic, and carrots on one large baking sheet. It’s okay if some of the ingredients are overlapping. Drizzle the olive oil along with a generous pinch of salt and pepper and give it a good toss so it’s all evenly seasoned. Place the baking tray in the oven and allow the ingredients to bake for 1 hour. Check on the ingredients around 30 minutes and give it a toss as needed. BLEND: Transfer the ingredients along with any juices from the baking tray to a blender and blend the veggies until they are completely smooth. If you’ve got a super powerful blender it will go in one batch and be super quick. If you’ve got a regular blender, you may need to add a little broth to help it along. If you’ve got a hand blender, you can skip this step and add all the remaining ingredients into a large pot and just blend it all there. SOUP: Transfer the puree into a large dutch oven over medium heat. Add the chicken broth and allow the soup to heat all the way through, about 5-7 minutes. Add the balsamic vinegar and red pepper flakes. Add two tablespoons of the pesto and give the soup a taste. If desired, add more. I used 4 in total because I love a little extra punch of basil. Season with additional salt and pepp as desired. Serve with cheese toasts. TO MAKE THE CHEESE TOASTS: On slices of baguette, place sliced provolone cheese, top with a sprinkle of salt, garlic powder, and Italian seasoning. Bake in a 400ºF oven for 4-5 minutes or until the cheese is bubbly!